There are forgeries hanging in an art museum in Springfield, Massachusetts. But before anyone calls the cops, you should know the paintings are part of an unusual exhibit highlighting the multimillion dollar industry of fake art. 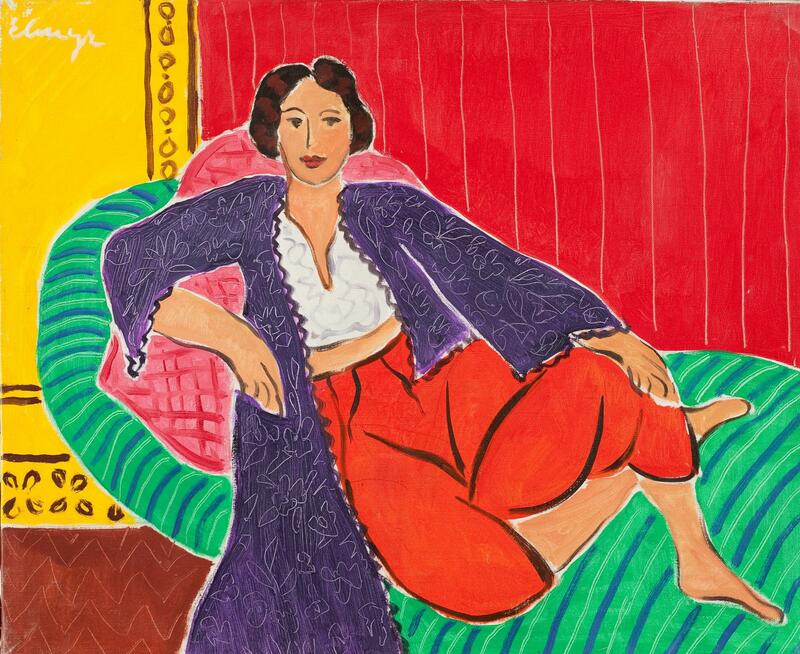 Elmyr de Hory's forged Matisse, " Odalisque" is one of the paintings on display in the exhibit on deception in the art world. As long as art has existed there has been art forgery. As long as there is a big money art market there will be attempts to fool dealers and collectors. Modern science is making it harder to pull the wool over the eyes of museum directors and art historians. Those are some of the takeaways from the show Intent to Deceive: Fakes and Forgeries in the Art World, which had its international debut recently at Springfield’s D’Amour Museum of Fine Arts. The subject of art forgeries has been used in novels, movies – including Best Picture Oscar Nominee American Hustle -- and TV shows, but until now it was not something museums talked publicly about, according to Heather Haskell, Director of Art Museums at the Springfield Museums. "Museums just haven't explored that, and we are really excited about offering this to our audience. It is a great opportunity for connoisseurs to look at real work next to a copy and see if you can tell the differences." More than 60 paintings are on display, including genuine works by Picasso, Matisse and other masters displayed next to copies. The paintings and drawings of five forgers, two of whom are still alive, are featured along with personal effects, photographs and videos, samples of the materials they used and explanations of the techniques employed to produce convincing fakes. The exhibit also explains how experts use forensic science to finger the fakes. Some of the forgeries in the show were once displayed in museums as originals. Not all forgeries are copies of famous works. One of the featured forgers in the Springfield exhibit, John Myatt, copied the styles of Matisse, Monet, van Gogh, and others to produce more than 200 paintings. The British artist, after serving a prison term, now runs a business that assists museums and galleries in identifying fakes. One of the five forgers did not do it for the money. Mark Landis dressed as a Jesuit priest and would show up at museums around the country to donate his fake art. He did it because he liked the attention. Haskell said the show also encourages people to look at art with a more discerning eye. "We've been having a lot of fun with this exhibition. It opens us to a lot of discussion on a number of different levels about what is art, what is the importance of the vision of the artist." The show was organized by independent curator Colette Loll of the Washington D.C.-based International Arts and Artists organization. It will be on display in Springfield through April 24th 2014. The Springfield Museums will soon put on public display a rare anthropological treasure that had been misidentified and kept in storage for more than a century. Officials at the science museum in Springfield, Massachusetts announced the discovery today. Officials at the Springfield Museums say they have authenticated an artifact in the permanent collection as a mid- 19th Century Tlingit helmet that likely belonged to a warrior for a tribe of the indigenous peoples in southeast Alaska. There are fewer than 100 Tlingit war helmets known to be in existence. Another public works project is planned in an historic part of downtown Springfield. It is an area of the city that has already seen close to $200 million in government investment over the last decade. WAMC”s Pioneer Valley Bureau Chief Paul Tuthill reports. A new Massachusetts cultural district has been launched in Springfield. Advocates for the district believe it will help boost tourism, promote more art and music programs, and preserve historic buildings. The “Springfield Central Cultural District” is an area of the city’s downtown that is home to museums, live performance venues, art galleries and historic buildings. It is the 19th cultural district recognized by the state – a designation not easy to come by, according to Anita Walker, executive director of the state cultural council.